Protologue: Fl. adv. Montpellier: 203 (1912). Amaranthus tristis auct. non L.
Amarante, brède de Malabar (Fr). 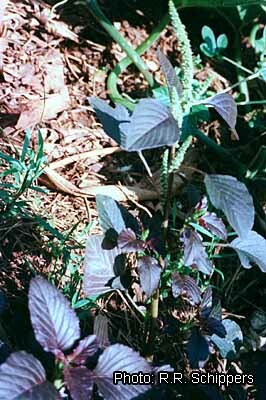 Amaranthus dubius is a weedy plant widespread throughout the humid lowland tropics. It originates from tropical America, where it is common in the Caribbean region and from southern Mexico to northern South America. The cultivated type may have been developed from the weedy ancestor in tropical Asia (Indonesia, India) and is found in several African and Central American countries, where immigrants have introduced it. Amaranthus dubius is a protected weed used as a pot herb in many African countries, and it possibly occurs in all African lowland areas. It is a cultivated vegetable in West Africa (Sierra Leone, Ghana, Benin, Nigeria), Central Africa (Cameroon, Democratic Republic of Congo), and East Africa (Kenya, Uganda), but is much less common than Amaranthus cruentus L.
The main use of Amaranthus dubius is as a cooked leaf vegetable. The product is dark green and tender but its taste somewhat neutral. In Kenya it is cooked with bitter leaf vegetables such as nightshades (Solanum spp. ), Cleome gynandra L. or Launaea cornuta (Hochst. ex Oliv. & Hiern) C.Jeffrey to make it more palatable. The leaves easily become soft after 5–10 minutes cooking in lightly salted water. It is not common to add potash. Amaranth leaves in general are recommended as a good food with medicinal properties for young children, lactating mothers and for patients with fever, haemorrhage, anaemia, constipation or kidney complaints. In Tanzania the whole plant is used as a medicine against stomachache. In Uganda Amaranthus dubius plants are used for the preparation of potash. Amaranthus dubius is a subsistence vegetable and a collected pot herb, seldom found in markets, but in Kenya it is grown on a commercial scale and sold in city markets. No statistical data on production are available. Commercial growers prefer the more productive Amaranthus cruentus. No international trade has been reported, but Amaranthus dubius of the local type ‘Klaroen’ is exported from Suriname to the Netherlands. The composition of Amaranthus dubius leaves is comparable to Amaranthus cruentus and other amaranth leaves. The average composition of amaranth leaves per 100 g edible portion is: water 84.0 g, energy 176 kJ (42 kcal), protein 4.6 g, fat 0.2 g, carbohydrate 8.3 g, fibre 1.8 g, Ca 410 mg, P 103 mg, Fe 8.9 mg, β-carotene 5716 μg, thiamin 0.05 mg, riboflavin 0.42 mg, niacin 1.2 mg, ascorbic acid 64 mg (Leung, W.-T.W., Busson, F. & Jardin, C., 1968). The leaves and stems contain nitrate, mostly in the stems, and also oxalate at a level comparable to other green leaf vegetables. Most people cook amaranth in ample water and discard the cooking water containing soluble nitrate and oxalate. The presence of a rather high content of hydrocyanic acid and oxalic acid makes amaranth less suitable for fresh consumption by humans and as fodder for animals. Amaranthus dubius can be substituted by other amaranths or other dark green leaf vegetables. Erect annual herb, up to 150 cm tall; stems slender to stout, branched, glabrous or upwards, especially in the inflorescence, with short to rather long hairs. Leaves arranged spirally, simple, without stipules; petiole up to 8.5(–12) cm long; lamina ovate or rhomboid-ovate, 1.5–12(–22) cm × 0.7–8(–14) cm, cuneate at the base, blunt or retuse at apex, mucronate, entire, glabrous or shortly pilose, sometimes the centre of the lamina blotched red. Inflorescence spikelike or paniculate, axillary and terminal, the terminal one up to 25 cm long, consisting of glomerules more or less isolated at base of inflorescence and agglomerated towards apex; bracts up to 2.5 mm long, awned. Flowers unisexual, subsessile, with (4–)5 tepals up to 2.5 mm long; male flowers usually near apex of inflorescences, with 5 stamens c. 2 mm long; female flowers with superior, 1-celled ovary crowned by 3 stigmas. Fruit an ovoid-urceolate capsule c. 1.5 mm long, with a short inflated beak below the stigmas, dehiscing circularly, the lid strongly rugulose below the beak, 1-seeded. Seed lenticular, compressed, c. 1 mm long, black. Amaranthus comprises about 70 species, of which about 40 are native to the Americas. It includes at least 17 species with edible leaves. Amaranthus dubius is the only known tetraploid Amaranthus species (2n = 64). It has been postulated as an allotetraploid, with Amaranthus spinosus L. as one of the parents and Amaranthus quitensis Humb., Bonpl. & Kunth or Amaranthus hybridus L. as the other. This theory is disputable because of the different chromosome number of Amaranthus spinosus (2n = 34). Also, a DNA analysis of the various genomes could not confirm Amaranthus spinosus and Amaranthus hybridus as ancestors of Amaranthus dubius. It is almost impossible to make a distinction between Amaranthus dubius and Amaranthus spinosus based on morphological characters; Amaranthus spinosus has axillary spines which are not present in Amaranthus dubius. However, spineless Amaranthus spinosus plants with 2n = 34 have been observed in several localities. In Nigeria an Amaranthus dubius plant with 2n = 32 has been recorded; this might be a spineless Amaranthus spinosus. Other more or less reliable differences are the greater number of terminal male flowers in the inflorescences of Amaranthus spinosus and the smaller pores of the pollen. Spontaneous hybrids between Amaranthus dubius and Amaranthus blitum L. mostly with 2n = 32 have been reported from India and America. Weedy Amaranthus dubius is a small prostrate plant found in open places on wasteland. Cultivated types of Amaranthus dubius differ greatly from weedy types; the plants are larger, more erect and more succulent. Several local types and cultivars occur. Emergence of the seedling takes place 3–5 days after sowing. The vegetative development is fast. Like maize and sugar cane, the genus Amaranthus is characterized by the C4-cycle photosynthetic pathway, which means a high rate of photosynthesis at high temperature and radiation. Flowering may start 4–8 weeks after sowing. The plants continue to produce new shoots when older branches are already blooming. Pollination is effected by wind but the abundant pollen production causes a high rate of self-pollination. The first seeds mature about 6 weeks after sowing. In backyards with repeated pickings, Amaranthus dubius plants may become perennial, up to 2 years old. Amaranthus dubius is frequently found in tropical humid lowland from sea level up to 500 m altitude, and also but much less at higher elevations up to 2000 m. It is a common plant in waste places, roadsides, flood plains, river banks and cleared forest areas. It shows a weak quantitative short-day reaction. Vegetable amaranths grow well at day temperatures above 25°C and night temperatures not lower than 15°C. Shade is disadvantageous except in cases of drought stress. Amaranths like fertile, well-drained soils with a loose structure. The seed of Amaranthus dubius is smaller than that of other cultivated amaranths, with 4000–6000 seeds/g. At harvest growers spare a few vigorous plants for seed. Market seed production in the field yields around 500 kg seed per ha in a five-month period. For commercial seed production an isolation distance of 200 m should be respected. In the wild and in home gardens the seed of fruiting plants scatters and gives rise to new plants automatically. The seed may remain dormant in the soil for several years. It germinates when it comes to the surface or in the top 3 cm of the soil. Yet in germination trials with vegetable types, germination was stimulated by darkness. The seed may be mixed with sand for easier sowing. It is common practice to sow directly, broadcast or in rows with about 20 cm between the rows, with a seed rate of 1–5 g/m2. Another cultivation method is sowing in a nursery at a rate of 2–10 g/m2 and transplanting after 2–3 weeks. From a nursery, the grower obtains up to 1000 plantlets per m2 for transplanting. A plant density of 100–200 plants/m2 can be practised for once-over harvesting while 25 plants/m2 is appropriate for repeated cuttings. Amaranthus dubius is especially well-suited to repeated cutting. For market production Amaranthus dubius is normally grown as a sole crop on beds. It is also found in intercropping systems with food crops. In fields and home gardens, the only care given to weedy Amaranthus dubius plants is selective weeding. Amaranthus dubius is fast growing, albeit less than the more commonly cultivated Amaranthus cruentus. Because of the rather strong growth of Amaranthus dubius, weeds in transplanted plots are not very troublesome, except nut grass (Cyperus rotundus L.). If rainfall is not sufficient, irrigation by sprinkling should be done before the plants reach their wilting point. Amaranthus dubius is much more susceptible to drought than Amaranthus cruentus. Watering every day with 6 mm (6 l/m2) is sufficient. Water shortage causes early flowering, which reduces the yield and the market quality. Amaranth is a very high consumer of minerals. On poor soils only modest crops can be produced. Amaranth responds to high rates of organic fertilizer. In some places it is grown on large quantities (up to 50 t/ha) of almost fresh town refuse, which fulfils its need for nutrients. On poor soils, the application of 400 kg/ha of NPK 10–10–20 in addition to 25 t of organic manure is recommended. A split application is recommended during the rainy season. Nitrate-N is better than ammonium-N. Amaranth does not seem to need to be rotated with other crops since no serious soilborne disease has been observed. In general Amaranthus dubius is susceptible to the main pests and diseases of Amaranthus cruentus, but it is less susceptible to stemrot caused by the fungus Choanephora cucurbitarum, the main disease of Amaranthus cruentus, and to damping-off caused by Pythium. For this reason the former is recommended for cultivation during the rainy season. No virus diseases have been reported. Amaranth is not very susceptible to nematode damage. Insects are a serious problem for amaranth growers. Caterpillars (Hymenia recurvalis, Spodoptera litura, Heliothis armigera) and sometimes grasshoppers are the most harmful pests. The larvae of the stem borer Lixus truncatulus may cause much damage, sometimes already in the seedbed. The basal part of the plant containing the pupae swells and the plant growth is much retarded. Many other insects such as aphids, leaf miners, stinkbugs, mole crickets, as well as mites attack amaranth but generally cause only minor damage. Commercial growers now spray insecticides instead of using the traditional control method of spreading wood ash to dispel insects. Weedy Amaranthus dubius is a host plant for the bacterium Xanthomonas campestris affecting tomato and for the nematode Rotylenchulus reniformis affecting banana. Commercial growers harvest by uprooting, by cutting at ground level or by ratooning. If the crop is sown directly, a once-over harvest by uprooting or by cutting at ground level may be done 3–4 weeks after sowing. Some growers obtain a second harvest 3 weeks later from the regrowth of the smallest plants. When ratooning is practised, the first cutting takes place about one month after transplanting, and then every 2–3 weeks for a period of 1–2 months. Cutting should be done at such a height that at least 2 leaves and buds are left behind for regrowth; the best cutting height is 10–15 cm. Commercial growers harvest 1.5–2.5 kg/m2 of an uprooted crop (dry matter content 16%, edible portion 35–50%); the first cutting of a ratooned crop may yield 1–2 kg/m2 (edible portion 70–80%), subsequent cuttings about 1 kg/m2. The harvested plants or shoots are bundled, the roots are washed, and the produce is packed for transport to the market. In markets and shops, it is sprinkled with water to keep a fresh appearance. If uprooted, the vegetable can be kept fresh for some days by putting it in a basin with the roots in the water. It is sold in bunches or by weight. Amaranthus dubius is present in Indian collections at the National Bureau of Plant Genetic Resources (NBPGR), New Delhi (India). Some East and southern African research institutes may have small working collections of local cultivars. Evaluation and variability studies are needed to reveal the amount of exploitable genetic variation. Breeding of Amaranthus dubius as a leafy vegetable has been carried out at Tamil Nadu Agricultural University, Coimbatore, India; several commercial cultivars are available. Amaranthus dubius is recognized as an easy-to-grow, productive and nutritious vegetable, especially for the rainy season. Research should focus on optimization of cultural practices (integrated pest management to avoid pesticide residues, plant nutrition). Baquar, S.R. & Olusi, O.O., 1988. Cytomorphological and phylogenetic studies of the genus Amaranthus from Nigeria. Kromosomo (Tokyo) 2(51–52): 1665–1674. Grubben, G.J.H., 1975. La culture de l’amarante, légume-feuilles tropical, avec référence spéciale au Sud-Dahomey. Mededelingen Landbouwhogeschool Wageningen 75–6. Wageningen, Netherlands. 223 pp. Grubben, G.J.H. & van Sloten, D.H., 1981. Genetic resources of amaranths: a global plan of action, including a provisional key to some edible species of the family Amaranthaceae by Laurie B. Feine-Dudley. International Board for Plant Genetic Resources, Rome, Italy. 57 pp. Grant, W.F., 1959. Cytogenetic studies in Amaranthus. II. Natural interspecific hybridization between Amaranthus dubius and Amaranthus spinosus. Canadian Journal of Botany 37: 1063–1070. Greizerstein, E.J. & Poggio, L., 1992. Estudios cytogeneticos de seis hibridos interspecificos de Amaranthus (Amaranthaceae). Darwinia 31: 159–165. Pal, M. & Khoshoo, T.N., 1965. Origin of Amaranthus dubius. Current Science 34(12): 370–371. Ranade, S.A., Kumar, A., Goswami, M., Farooqui, N. & Sane, P.V., 1997. Genome analysis of amaranths: determination of inter- and intraspecies variations. Journal of Biosciences 22(4): 457–464. Senft, J.P., Kauffman, C.S. & Bailey, N.N., 1981. The genus Amaranthus: a comprehensive bibliography. Rodale Press, Emmaus, Pennsylvania, United States. 217 pp. Grubben, G.J.H., 2004. Amaranthus dubius Mart. ex Thell. [Internet] Record from PROTA4U. Grubben, G.J.H. & Denton, O.A. (Editors). PROTA (Plant Resources of Tropical Africa / Ressources végétales de l’Afrique tropicale), Wageningen, Netherlands. Accessed 10 April 2019. This page was last modified on 29 April 2018, at 21:15.